Bite the Bagel is a locally owned business that is dedicated to providing the highest quality food and service. 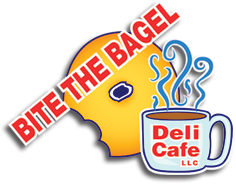 We're the best place in town for fresh baked bagels, italian bread, premium deli sandwiches and subs, soups, gourmet salads, specialty coffees and desserts. Our products are made from scratch and baked daily in authentic, New York style to provide you with the freshest bagels and sandwiches around. Whether your morning needs a kickstart with our freshly brewed coffee or you're just looking for a fresh and flavor-packed lunch, Bite the Bagel has what you want. Don't just take our word for it, come stop by one of our two locations in Killeen or Harker Heights, TX and see for yourself just why we're the best deli cafe around. We'll save a bagel for you! 2710 S. Clear Creek Rd. Bite the Bagel Deli Café is a unique, quality oriented bakery-deli focused on providing you with affordable, fresh baked products; quality and health conscious sandwiches made with premium deli meats and cheeses; gourmet coffee, tea; and homemade specialty soups.